Here it is, late summer already, the time of year the Chinese regard as the "fifth season." Others have called it "high season" or the "in-between season." As we transition into that wonderful moment between summer and fall when everything reaches completeness, I asked members of the Slow Flowers Community to share their favorite standouts of the fifth season — uncommon and tried-and-true botanicals that appear in our fields and design studios as summer turns to autumn; as hints of fall beckon. 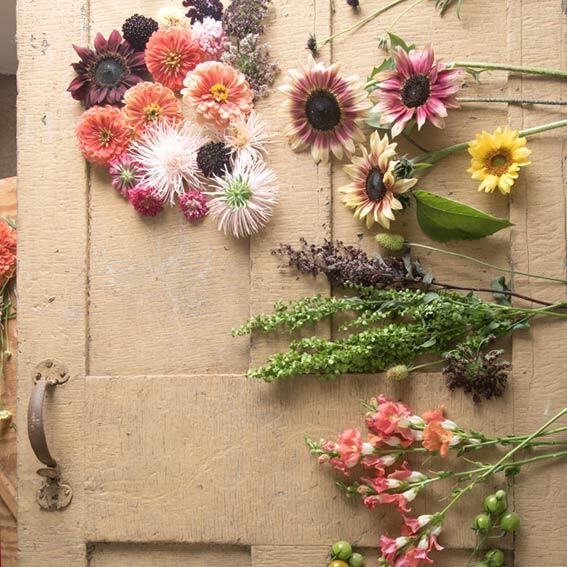 I've collected the stars of late summer — the flowers, foliages, herbs, seeds, pods, edibles and vines that seemingly wait until now to show their best attributes for our bouquets and vases. The submissions are nothing short of inspiring — coming from passionate home gardeners, as well as talented flower farmers and gifted florists. Everyone, it seems, has a heightened awareness of the bounty of the season. Here's to the Fifth Season! 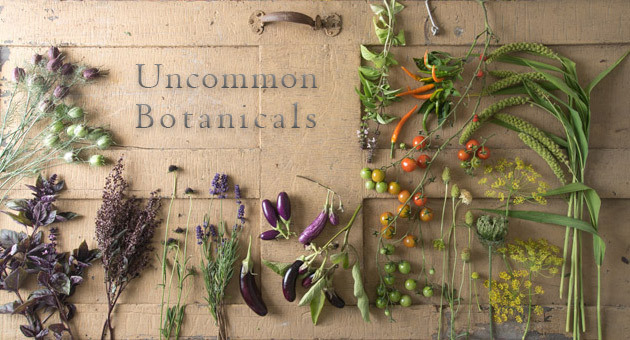 Grand or modest, formal or wild, every aesthetic has a place for seasonal botanicals. Big and bold are beautiful, in Pittsburgh floral artist Thommy Conroy's version of a fifth-season spectacle. "I love the notion of a fifth season," he says. "For years I've called it 'high summer' for my bridal clients — everything is abundant and overflowing. It's a great time to be working with farms and local materials as the fields are bursting and materials are rich. The end of the season is one of my favorite moments." 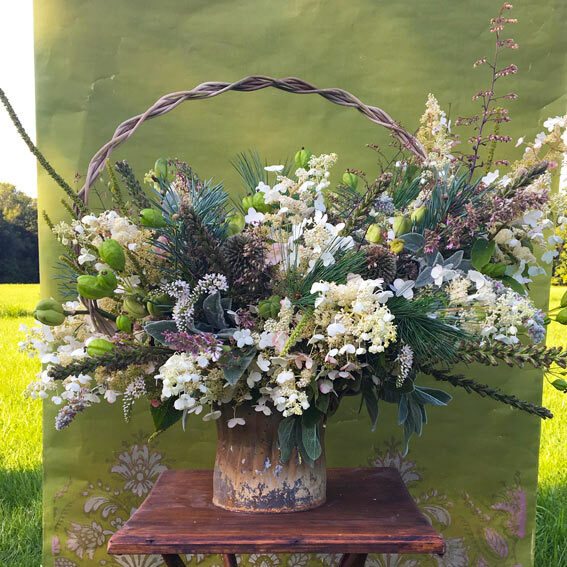 Lisa Derx of Apricity Flowers in Dayton, Maryland, says, "For me, the fifth season is about summer rushing into fall, when a change in temperature elicits a change in the color palette." "The weather here in Zone 7 where I grow my flowers has been cool this August, so my hypericum is a sweet addition, along with ageratum to add a few blue notes. Ammi is both summer-fresh and starting to edge into deeper tones, signifying the blend of seasons." Nan Matteson of Queen City Flower Farm in Cincinnati, Ohio, calls herself an "urban mini-micro flower farmer" and her passion for local flowers is evident when she brings her blooms to area farmers' markets. 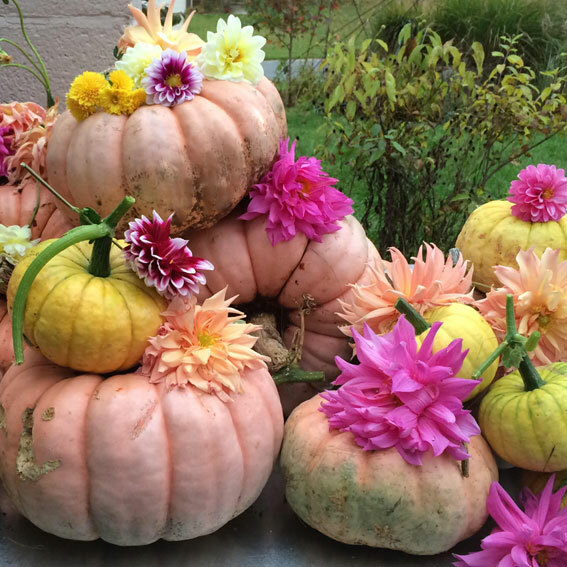 "I was just playing one day for myself and came up with this vignette," which combines dahlias with chunky 'Porcelain Doll' and mini pumpkins. "It feels fall to me," she says,"but in such an unconventional way. Dahlias are at their finest this time of year." Clara's Garden, Jen Hinson's flower farm and floral design studio, is based in Mediapolis, Iowa, in the southeast corner of her state. This evocative late-summer composition includes dahlias, amaranth, celosia, hydrangea, dill, a single garden rose, and foraged and cultivated greens — all in an intentionally faded palette. Rachael and Jon Ackerman own Blue Sky Flower Farm in Lakeville, Minnesota. 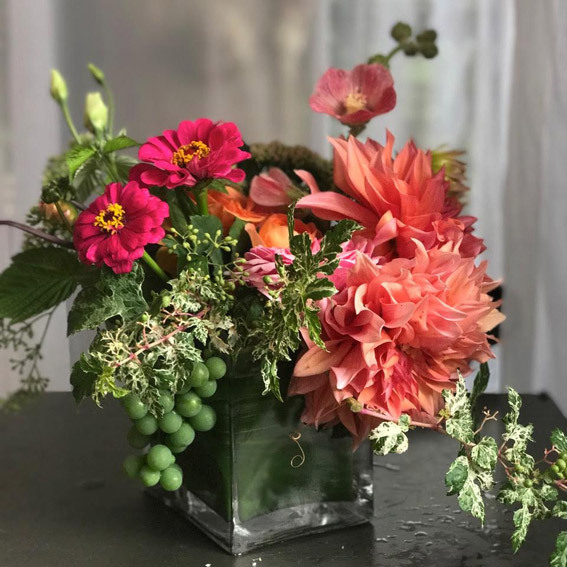 Among other channels, they sell their lovely woodies, perennials, annuals, and vines to the design community through the new Twin Cities Flower Exchange, a 100% local wholesale hub that opened earlier this year. Here are two of Rachael's favorite ingredients of the season: hops and pumpkin lantern plant. Singular sensation! Sometimes, just one bloom is all you need to sum up the vibe of late summer. 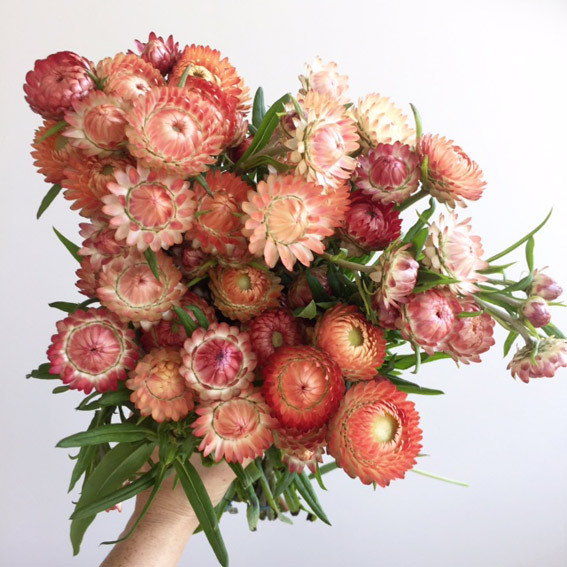 This bunch of 'Apricot/Peach Mix' straw flowers, grown by Amanda Maurmann of Gnome Grown Flower Farm in Ann Arbor, Michigan, was captured on camera by florist Susan McLeary of Passionflower Design Studio, for the emerging Michigan Flower Growers Cooperative. A stunning still-life from Field & Vase by Stow Greenhouses' Barbara Rietscha takes late-summer flowers to a new artistic plane. 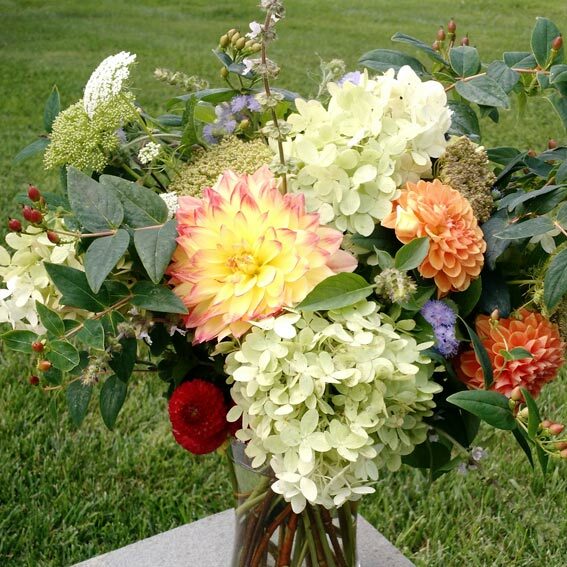 "I used all my fall favorites: dahlias, marigolds, celosia, delphinium, thistle, sweet William, and mums," she says. The weathered animal skull sets a pensive tone. 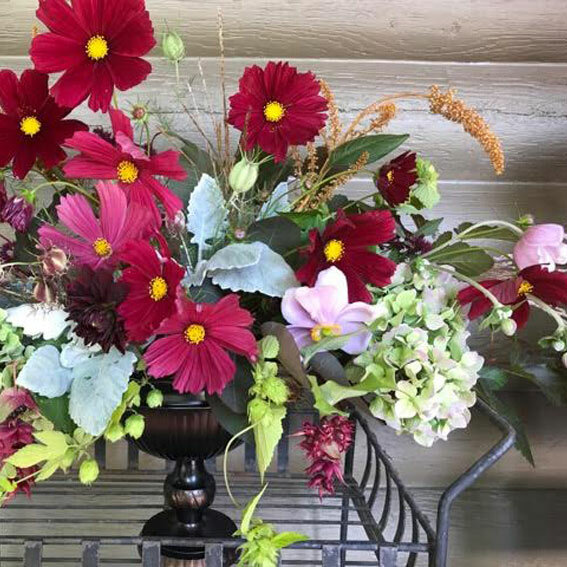 Debbie Bosworth of Dandelion House Flower Farm in Plymouth, Massachusetts, who calls herself a "backyard cut-flower farmer," celebrates the late-summer bounty with this charming pair of arrangements containing dahlias, amaranth, hydrangea, cosmos, sunflower, sedum, and grasses. "I call this September Flourish," she says. Based in New York's Catskills, Todd Carr and Carter Harrington own Hort & Pott, an emporium of handmade, vintage, botanical, and uncommon goods. 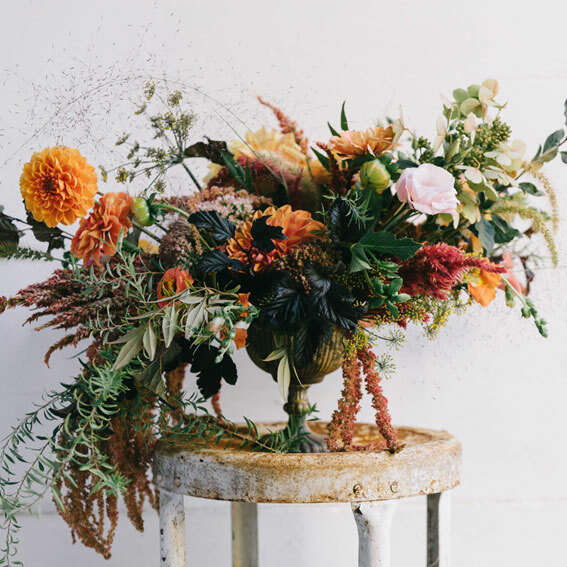 This arrangement "channels Late Summer, with the season's last blooms, plus pods and pine." 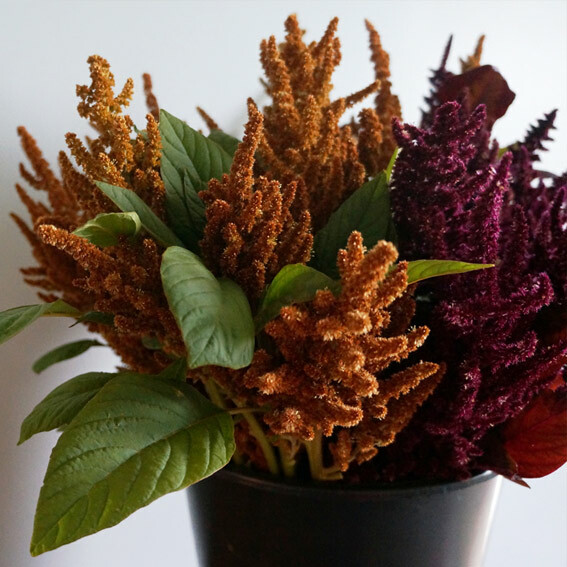 For Megan Balodis of Marshdale Farms, based in Hopewell, Nova Scotia, the season can be summed up in the bronzy, burnished hues of amaranth, arranged in a color-block of burgundy and copper. Leslie Gamsjager of Leslie Gamsjager Flowers in Woodbury, Connecticut, gathers this late-season design together using sunflowers, dahlias, dill, and hydrangea as focal blooms; alliums, snapdragons, celosias, and ageratum as spikes and fillers; and curly kale as a deep-green, textural foliage element. Fourth-generation flower farmer Jill Forrester grows flowers and produce on 10 acres in Whitton, Arkansas. She arranges hundreds of bouquets at the peak of season, selling them through local markets in Arkansas and Tennessee, and at Trolley Stop Market, the family's farm-to-table restaurant. 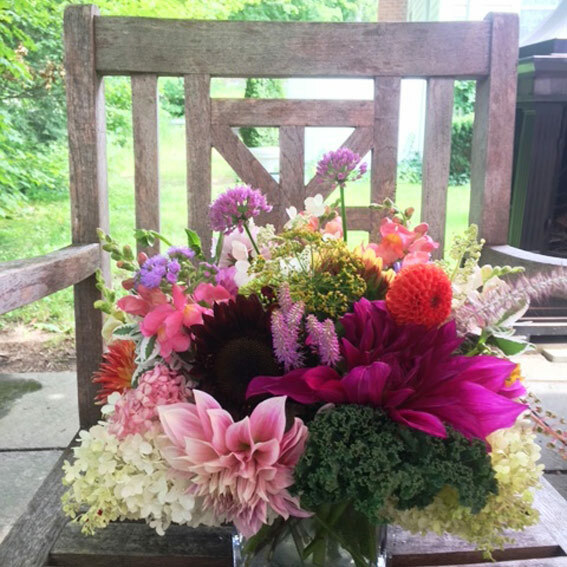 Jill raves about vitex — "one of our cut-flower mainstays; it thrives on neglect, and bees and butterflies love it" — which she uses as the spike elements in this fresh bouquet featuring dahlias, hydrangea, rudbeckia, zinnias, and celosia, gathered for birthday gift-giving. "Dahlias, Persian shield, hosta, creeping Jenny (lysimachia). 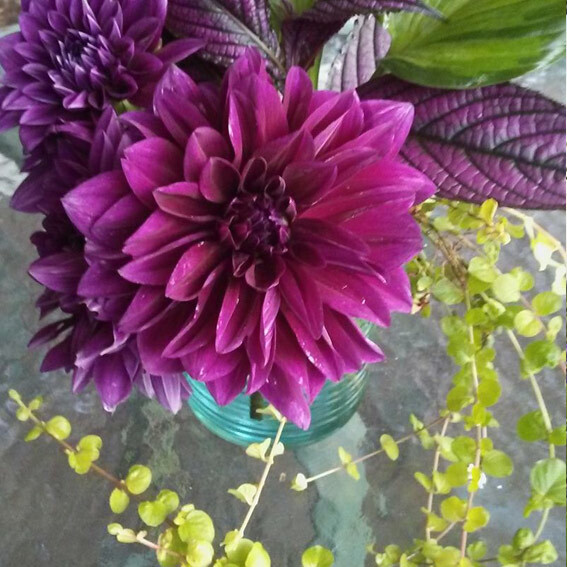 Purple and green — my favorite combo!" she says. 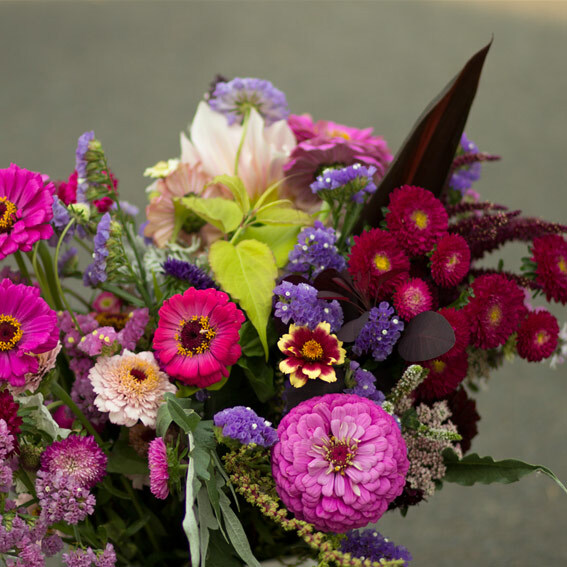 Kathleen Barber, a farmer–florist based in Warrenton, Oregon, owns Erika's Fresh Flowers. She gathered her favorite zinnias of the season for this arrangement, adding statice and aster in full appreciation of September, her favorite month of the year. Charles and Bethany Little of Eugene, Oregon-based Charles Little & Co. are known for the highly diversified selection of woodies, perennials, annuals, vines, and edibles that they grow. And, on occasion, they are inspired floral designers, as can be seen in this arrangement that Bethany created for a local restaurant. The vase exudes late summer, with limelight hydrangea, sage, artemisia, amaranth, celosia, dahlia, dusty miller, and novelty pineapple eucomis. 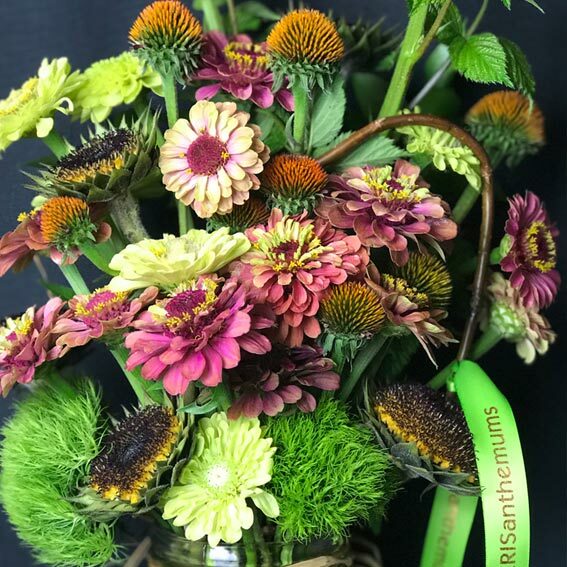 Kris Bennett of KRISanthemums in Hermiston, Oregon, is confident with color, pairing bright hues of summer's zinnias and dianthus 'Green Trick' with the darker seed heads of sunflowers and echinacea — all for this vivid late-summer bouquet. 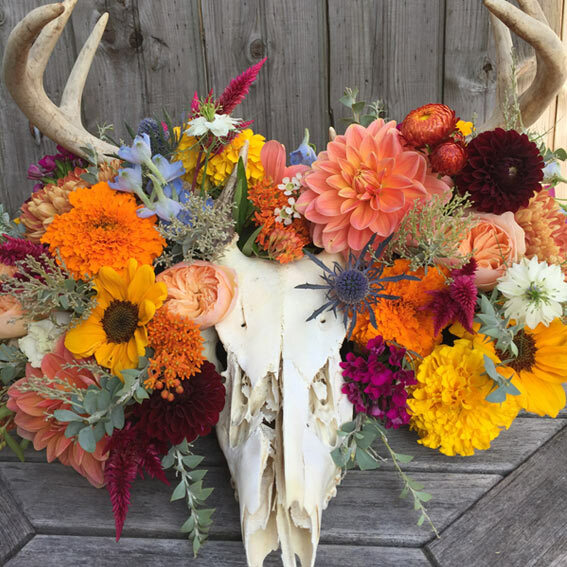 As a floral designer, Tammy Myers of First & Bloom based in Fall City, Washington, has developed her brand based on using exclusively American-grown flowers, especially those locally grown by farmers who are now her friends. 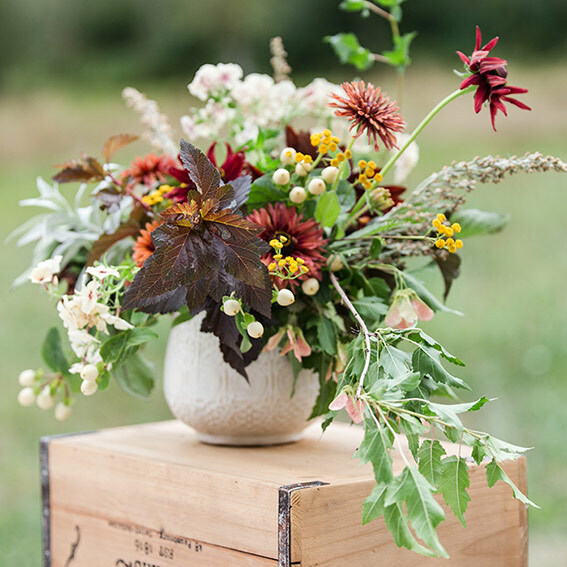 This late summer bouquet, designed for a recent workshop, includes foraged vine maple foliage, wine-hued ninebark, rudbeckia, hypericum, tansy, phlox 'Creme Brulée', and foraged grasses. 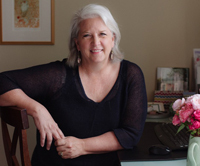 Trustee of the Elisabeth Carey Miller Botanical Garden in the Seattle area, Sue Nevler is an avid gardener whose lovely backyard bouquet of dahlias, crocosmia, hydrangea, viburnum, and oregano 'Kent Beauty' exemplifies the season. Studio florist Maura Whalen of Casablanca Floral in Seattle often clips from her own cutting garden for her commissions. Her late-summer palette combines dahlias, zinnias, and hollyhock with wine grape clusters and porcelain vine. Sara Jane Camacho of Thatch Floral in Seattle, combines cheerful single yellow dahlias with scented geranium, pearly everlasting, and foraged pods from a golden raintree for a buttery-bright seasonal arrangement. Sandy Figel of Verbena Floral in Seattle, uses cheerful cosmos as the focal blooms in this seasonal compote, then heightens the tone with hydrangea, hops, nigella pods, dusty miller, ornamental grasses, and amaranth. Pink fall-flowering Japanese anemones provide the finishing touch! 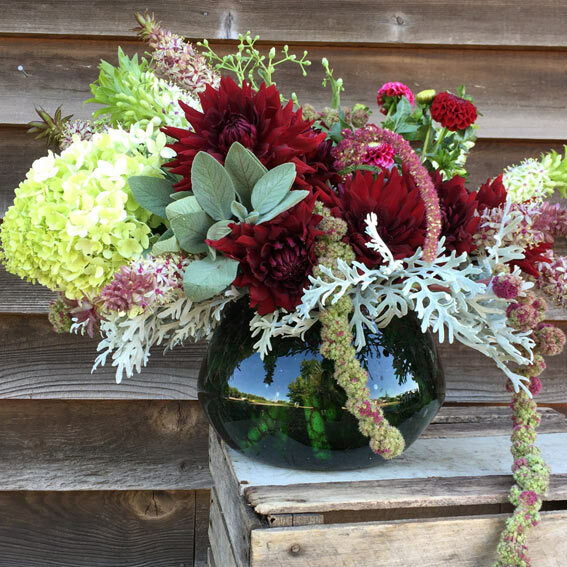 Leigh Grossman, creative director of Seattle-based Fiore Floral Design brings uncommon seasonal ingredients to her formally-styled centerpieces. First, a "texture bowl" featuring Phalaenopsis orchids, succulents, peony pods, foraged tree ivy, and fresh contorted willow from the studio's "grow garden," along with roses, blackberry, seeded eucalyptus, and ming fern asparagus. Next, a combination of blue and purple hydrangeas, succulents, monarda, eryngium, foraged bittersweet, and Rex begonia foliage from the studio's grow garden, along with Phalaenopsis orchids, sea holly, and white heather, sourced domestically. 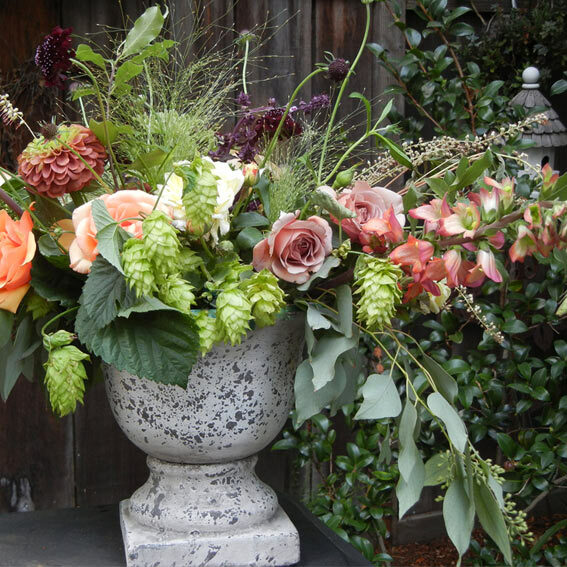 Katherine Glazier, a floral design instructor at the public garden estate Filoli in Woodside, California, loves to use locally-grown botanicals in her workshops. Farmer–florist Hedda Brorstrom of Full Bloom Flower Farm grows organically on her acreage in Sonoma County. Her designs are layered, detailed, and rich with character. Here are two late-summer beauties. First, an uncommon bouquet with cardoon blooms, crocosmia, echinops, delphinium, lotus pod, garden roses, strawflower, and succulents. 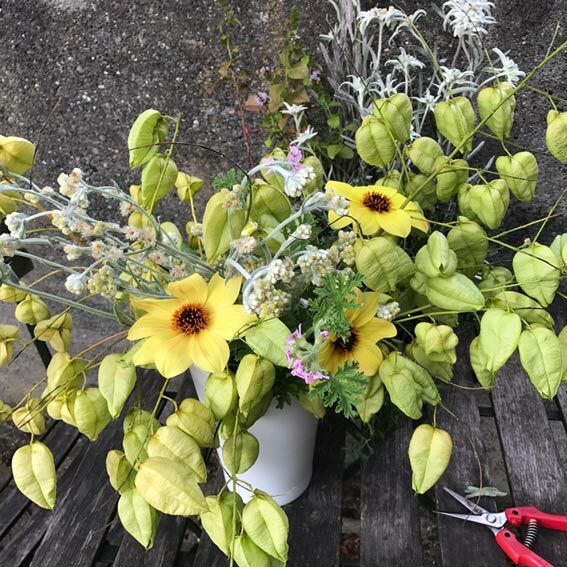 Next, an urn brimming with 'Café au Lait' dahlia, 'Dara' ammi, foxglove, scabiosa, lisianthus, echinops, dusty miller, tuberose, and 'Cherry Caramel' phlox. Whether you are looking back to evaluate your past growing season or planting for your next one, may you find a few moments to enjoy the fullness of the Fifth Season. According to Chinese philosophy, this is the time of year for centering and rooting oneself — for it lies directly between spring/summer and fall/winter. Wherever you grow, when it comes time to plan ahead for an abundant, late-summer harvest, seeds for many of these fine design elements will be available from Johnny's.